The subject of this photograph is a Decoration Day parade, but the architecture also is fascinating. The Romanesque-style U. S. Post Office building on the right was constructed from 1889-1891. Designed by the supervising architect for the U. S. Treasury, W. A. Freret, it featured brownstone hewn from a quarry in Wadesboro, NC. Interior decorations included fine lighting fixtures from Philadelphia and massive cherry roll-top desks made in Baltimore. Sadly, the building was razed in 1936 for the dual purpose of constructing a larger post office and creating jobs for some of the many Wilmingtonians the Depression had idled. The corner of Front and Chestnut streets was considered the busiest, windiest intersection in town. Murchison National Bank first occupied the 1902 Acme Building (on right), designed by Charles McMillen. The thriving bank was founded by the same man who built The Orton hotel, Kenneth M. Murchison. 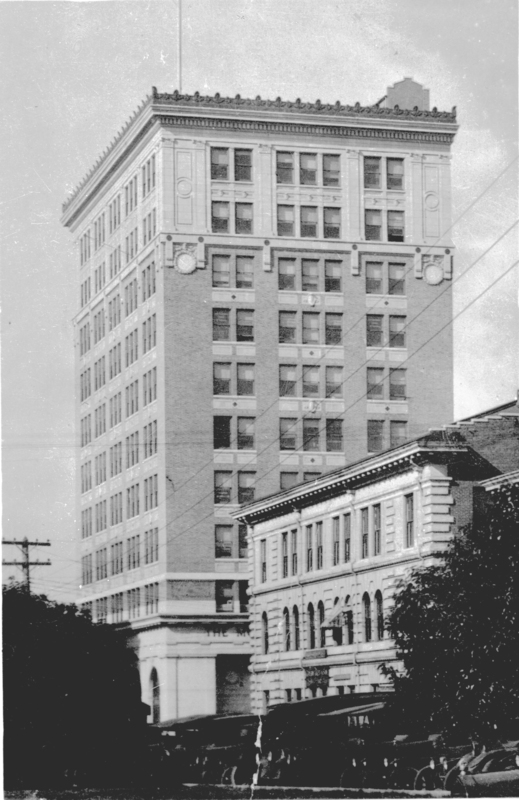 In 1914, Murchison Bank moved across the street to the eleven-story Murchison Building seen on the left. The Bijou (four doors down on the left, with pointed roof), North Carolina’s first movie theater, opened December 24, 1906 in a tent. The earliest features were fifteen minutes long, and ran over and over, all day long, for three days. 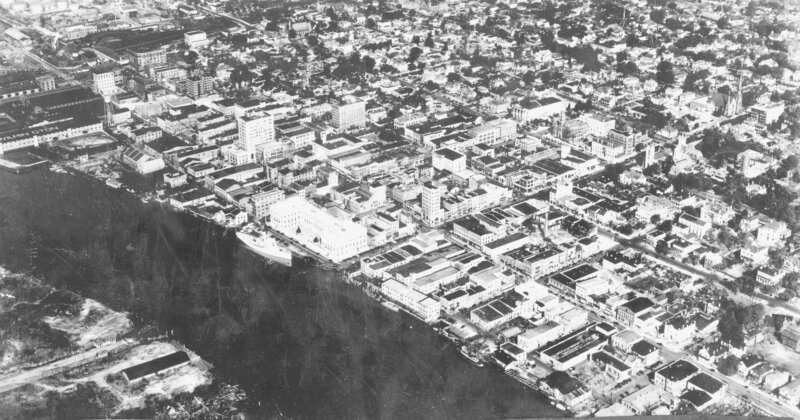 Adding an earthy element, seafood markets thrived in downtown Wilmington from colonial days throughout Louis T. Moore’s days as photographer of panoramics. In June 1932, seven firemen from Wilmington and Hiram Hewlett, the night patrolman at Wrightsville Beach, caught a nine-foot shark. They were fishing at The Rocks, aboard Captain Fred Hanson’s 40-foot boat, the Newport. Hewlett, seated on the side of the boat, with his feet dangling in the water, “narrowly escaped having his foot bitten off.” Here, an unidentified man poses with the shark, at 116 South Water Street: J. B. Fales Fish House. “Fales Fish House had competition, but they were the best,” said Clarence Jones, who made frequent trips to downtown Wilmington. “Whenever someone caught an unusual fish, they would display it out front. It didn’t matter if the shark or dolphin stayed out too long, because, in those days, no one ate shark or dolphin. Fales would take care of destroying the fish when the time came. The Morning Star occupied the two-story building at 109 Chestnut Street. In 1929, Wilmington had two newspapers: the Morning Star and the News Dispatch. The News Dispatch, owned principally by Wilmingtonians Chesley C. Bellamy, Joseph E. Thompson and Joshua Horne, was an afternoon paper. The Morning Star, established in 1867, was one of four newspapers owned by Page Brothers of Columbus, Georgia. Rinaldo Page was Wimington manager and Lamont Smith, editor. This rare vertical shot shows the 1914 Murchison Building that still stands tall at 201 North Front Street. It was built on the site of banker James Dawson’s House, later the home of Wilmington’s Cape Fear Club. Pembroke Jones’ rice milling plant formerly sat on the western end of the Murchison Building property. The new structure was designed by architect Kenneth M. Murchison, James Sprunt’s brother-in-law, and the eleven story structure was Wilmington’s tallest building for almost a century. Here, Walter Corbett totes a basketful of treats along Chestnut Street. On Saturdays, he carried his specialties, fried chicken and individual pies, to Union Station at Front and Red Cross streets, and to the City Market. The Corbett brothers, Walter and John, and William D. Polite, James Sprunt’s butler, were good friends. In 1922, when Mr. Polite, an etiquette teacher and entrepreneur, organized the Waiters and Cook Catering Association, Inc., the three of them worked together and Walter served as financial secretary. Walter James and John E. Corbett were sons of Isaiah Corbett of Ivanhoe. The brothers served in World War I and are buried in National Cemetery. Wilmingtonian Kenneth McLaurin had his first working experience at Walter and Edith Corbett’s house at 201 South 13th Street, where they operated a tourist home and eating establishment. McLaurin’s job was to bring in coals and wood for the fire and make trips to the Colonial Store, a grocery near 17th and Market streets. “In the days before open accommodations, that was the place to stay,” said McLaurin. “The Corbetts played hosts to many celebrities: Mahalia Jackson, the Globe Trotters, the cast of ‘Amos and Andy’ and Lloyd Price.” Years later, when Kenneth McLaurin was principal at Laney High School, he brushed shoulders with a celebrity in the making: student Michael Jordan. Wilmington architect J. F. Leitner designed Union Station (on right, at Front and Red Cross streets), Building B (on left), and a catwalk connection. He was assisted by Kenneth M. Murchison who also designed handsome railroad terminals in other cities: Hoboken, Baltimore, Scranton, and Jacksonville, Florida. During construction, Leitner recommended discarding the 1856 brass bell that tolled night and day atop the old station. Local folks protested and it became part of the new building. In 1956, the bell was featured on Don McNeill’s Breakfast Hour, a nationally syndicated radio show. By today’s standards, Union Station was a dressy place. In the 1920s, most men wore suits and hats and women wore dresses, hats, gloves and a new style shoe they called “cantilever” and we call high heels. The brass bell rang five minutes, on the minute, then for five seconds, heralding every departure. The three-story North Carolina Sorosis building (now razed), located at 116 North Third Street, was next-door neighbor to Wilmington’s City Hall. The Wilmington branch, chartered in 1895, had little more than a dozen members at the time. The ladies studied art, music and literature and gave liberally to worthy local causes. About 1900, club members began operating a library in the Odd Fellows Building. Members served as volunteer librarians and books were rented for a few cents a week. When the city established a public library at City Hall in 1907, the N. C. Sorosis donated 1700 books. In addition, the Sorosis sponsored music festivals, the 1921 outdoor drama “Pageant of the Lower Cape Fear,” fruit and vegetable exhibits, garden contests and the Baby Parade at the Feast of Pirates festival. The group established Travelers Aid, a baby clinic and the James Walker Memorial Hospital auxiliary. Mrs. Rufus Hicks led several members on a crusade to transform Greenfield Lake from a millpond to a showplace. After years of campaigning, the city purchased the site and worked with the Sorosis to beautify the grounds. In the absence of a permanent public gallery of art, the N. C. Sorosis building filled a vital role by hosting numerous art exhibits and lectures. It was the first place in which Claude Howell, in 1936, formally exhibited his work. Other artists who showed their paintings at 116 North Front Street included Delbert Palmer, Mrs. Will Rehder, R. C. McCarl, Mrs. Harry DeCover, Irene Price, Mrs. C. M. Weathers, Mrs. Ernest Bullock, Atha Hicks Josey, and Emma Lossen. The N. C. Sorosis also celebrated National Art Week by hanging small exhibits in local stores. The club hosted traveling shows, particularly the N. C. Artists’ Exhibits, and scheduled lectures by artists. Club member Phila Calder Nye, a Wilmington native who published an important book, Art History in Outline (1901), deserves much credit for spearheading and defining the N. C. Sorosis’ art program. The “Garage” building on the left was the home of MacMillan and Cameron. Today the name Cameron graces buildings all over Wilmington, and as far away as Lexington, VA, but it all started in this one automobile service station on North Third Street. The roots of the business go back to W. D. MacMillan, Jr. and the livery stable business he ran at 107-115 North Second Street, just behind this property. When Mr. MacMillan converted his stable into an automobile dealership, his blacksmiths automatically became Wilmington’s first horseless-carriage mechanics. A young man named Bruce B. Cameron (1890-1944) went to work for Mr. MacMillan, about 1908 and learned the brand-new industry. His early customers included Lee Simmons, with his Thomas Flyer; Monsignor Christopher Dennen in his Hudson Twenty; and A. L. Council, driving a 1909 Cadillac Touring Car. When Henry MacMillan died in 1920, his widow, Jane Williams MacMillan, became vice-president of the company, an unusual position for a woman of that era. She proved herself quickly and even published articles about her work. “Getting a Garage Known” earned her ten dollars when it appeared August 1928, in Automotive Merchandising. Both owners enjoyed entertaining, and company parties were lavish affairs, often hosted in the banquet room on the second floor of the garage. In 1930, MacMillan and Cameron celebrated its tenth anniversary with a party in the ballroom of the Hotel Cape Fear. MacMillan and Cameron opened other service stations around town, including the Sans Souci, a station that opened November 1, 1923, on the northwest corner of Ninth and Nixon streets. “Bruce Cameron spared no pains to make the station attractive,” stated the Morning Star. One item marketed at Sans Souci would have taken the edge off weary travelers: laughing gas. Wilmington City Hall, at 102 North Third Street, was built in 1854 according to the Italianate-Classical Revival design of New York architect John M. Trimble. James F. Post served as supervising architect, and Robert B. Wood, John Wood, and George Rose, as builders. Credit also is due to the individuals who commissioned it. Their opinion of Wilmington is ever stamped in the imposing structure with its large portico and massive Corinthian columns. Captain Samuel Potter’s House, at 211 Market Street, was still new in 1844, when presidential candidate Henry Clay delivered a speech from its balcony. “The wide street, for a considerable distance on either hand, was one dense mass of human beings, whilst the balconies, windows, etc., were crowded with ladies, all eager listeners to the words of the great statesman. Never was such a scene, or anything approaching it, witnessed in Wilmington,” wrote James Sprunt. Edward Kidder and his younger brother Frederic moved from New Ipswich, NH, to Wilmington in 1826. A few years later, Frederic returned to New England where he made a name for himself as an author and historian. Edward remained in Wilmington where he prospered and married Connecticut native Ann Potter. They built this New England-style house at 101 South Third Street, on a double lot that ran all the way through from Third to Fourth Street. They filled the adjacent lot with gardens and greenhouses that provided congratulatory bouquets and funeral arrangements to townspeople, gratis, for several decades. Edward Kidder became one of the most successful lumber merchants in the American South. He was a charter member of the Wilmington Chamber of Commerce and led a successful campaign to establish a Wilmington water works. Mr. Kidder gave liberally to educational charities and efforts to enhance the stays of visiting mariners. During the Civil War, Edward Kidder’s New England roots gripped firm. Despite enjoying his comfortable place in Wilmington society, he questioned the Confederacy’s position and made definite moves to confound Southern resistance. He lost a few of his local friends, but stayed close to a well-educated, powerful group of Wilmingtonians who, sharing his Northern heritage, were jarred with the concept of slavery and eager to establish a freer America. Ironically, Louis T. Moore took this photograph shortly before the 1924 Confederate Memorial, designed by Henry Bacon, took its place in the adjacent plaza at Third and Dock streets. John Allan Taylor (1798-1873), husband of Catherine Harriss, was a shipping agent who owned a Cape Fear ferry service owner, sawmill, tugboat fleet, and a Brunswick County plantation known as The Oaks – known today as Pleasant Oaks. In 1892, the Wilmington Light Infantry purchased the Taylor house. The WLI was organized May 20, 1853, and from the beginning aimed for distinction. Member Edward Cantwell, the first WLI captain, made Jefferson Davis, U. S. Secretary of War, an honorary member. In doing so, he procured 70 government issued breech-loading rifles and the WLI was spared using ordinary muskets. Handsome in their green uniforms trimmed with orange and gold, the WLI escorted President Buchanan when he visited the University of North Carolina. The marble house became the scene of many fancy dress balls. From 1956 until 1981, the Wilmington Public Library occupied the John Allan Taylor House. In that capacity, the building was an acoustical nightmare. Librarians insisted on silence, but hard surfaces amplified every sound. Children learned quickly that they must walk softly or find themselves the focal point of a matronly glare. Louis T. Moore spent much time during his later years working within the echoing walls of the marble library. The John Allan Taylor House is now the property of First Baptist Church (on right). City Market, at 110 South Front Street, functioned as the city’s grocery store for decades. These children, (left to right) Harry Alexander Nixon, Velma Elizabeth Nixon, and eight-year old Addie Larnese Nixon, went to the market to help their father, Wesley Nixon, a food vendor who farmed family land on Middle Sound. The children shelled peas and butterbeans and made change for customers. They also delivered fresh vegetables to the Honnet and Empie families. In their free time, they munched on sticky buns made by the Craig sisters and visited a Front Street candy store. The woman on the right, (unrelated to the Nixons) in the dark sweater is probably Evelina Bennett, a resident of Wrightsville Sound. City Market had only a few good years left when this photo was taken on a Saturday morning in 1936. . By 1940, real grocery stores had taken a toehold. Harry Alexander Nixon joined the Navy for four years, then spent 20 years in the U. S. Army. Velma Nixon Bennermen married a serviceman at age 18 and lived most of her adult life away from Wilmington. She died in Wilmington on June 29, 1999. Louis T. Moore went on a personal crusade to save the fountain, writing scores of letters to gather support. He also visited his friend and neighbor, architect Leslie N. Boney, and told him the problem. The architect, also a friend of the Kenan family, was happy to create a solution. Boney hailed from Duplin County, the Kenans’ ancestral home, and his wife, Mary Lily Hussey, was named for family friend Mary Lily Kenan Flagler. Working in the basement office of his Italianate home at 120 South Fifth Street, a block and a half from the fountain, he devised a plan to improve traffic flow through reducing the size of the monument by cutting away the lower tier and erecting a high wall. In 1924, he recorded what he saw inside the house — a house that was still a home. “Within, on the right side of the hallway, running through the house, are two stately salons – parlors, they are called – furnished sumptuously in Victorian mahogany; here are deeply stuccoed coves, sweeping draperies of velvet hanging from gilded Florentine cornices above the windows, cornices that match the gilded mirrors over the spacious fireplaces at the ends of the rooms; rich old-fashioned carpets upon the floors and bric-a-brac of a grand manner placed around the grand rooms. The John Dawson House and the Carolina Apartments building sit on the southern corners of the intersection of Fifth Avenue and Market Street. For almost fifty-five years, Mr. Dawson, a native of Belfast, ran a general merchandise business on the northeast corner of Front and Princess streets. A few months before his death, in 1881, Mr. Dawson sold his business to William E. Springer and Company. When this photograph was made, the John Dawson House was home to Mr. and Mrs. (Katie Reston) Adair McKoy, and their two children, Jean Victor McKoy (Graham) and Adair McKoy, Jr. The Boys’ Brigade Armory, on the southeast corner of Second and Church streets, was designed by architect Charles McMillen and dedicated June 22, 1905. The building was a gift from Mary Lily Kenan Flagler, whose brother, William Rand (“Buck”) Kenan, worked closely with the boys. At the time Mr. Moore took this photo, almost 3,000 youths a month attended programs or played sports in the Norman-style fortress. The building contained a gymnasium, dressing room, a library of 2,000 books that James Sprunt contributed, reception rooms, offices, an auditorium, bowling alley, dining room, and a kitchen. Riley Moore, an African American cook, served up fine meals for the Boys’ Brigade from 1896 until the 1930s. Col. Walker Taylor (1864-1937) founded the local Boys’ Brigade on Valentine’s Day, 1896, at Immanuel Presbyterian Church. He based the organization on a similar one he observed in Scotland – the Boys’ Brigade Company in North Woodside, Glasgow. The Wilmington group began with a membership of five, but grew quickly when word got out that Brigade membership offered free 10-day camping trips to Southport, NC. One of the most notable Brigade achievements took place during World War II, when members contributed to national defense by collecting scrap metal. The boys turned in enough iron, 1,418,974 pounds, to build a ship. They named it for the club founder. The S. S. Walker Taylor was launched March 28, 1943. I’m working on a book chapter about the Nye family of Fairhaven, Massachusetts–mostly William Foster Nye and his son, Joseph Keith Nye, who was married to Phila Calder Nye. I’m interested in their marriage. I’m guessing that Phila met Joseph, when he was in North Carolina harvesting porpoises for his whale oil business. It’s possible, though, that they met through their interest in art. I know that they were “estranged,” though I don’t think they were actually divorced. Any light you could shed on this would be much appreciated. Go to sblock.net – then search for Calder and/or Nye. There are some Calders here still. One or two of them are attorney.